Cereal is the optimal college breakfast food. Easy, quick, and healthful, cereals are great for low-maintenance groggy-eyed mornings before your 9 a.m. class. You do want to be sure to choose cereals that are low in sugar (that’s the most important thing), and high in fiber if you can stand it. Cereal’s also a good afternoon or late-night snack, especially when you’ve got a lot of studying on your plate. Here are the yummiest and most nourishing cereals to eat! 1. Homemade granola. By making granola yourself, you are exactly aware of the ingredients in your cereal. You can adjust the recipe to be healthier, or align it to your personal taste. It’s also great to mix rich, delicious granola with a leaner cereal in the morning, in essence creating your own Honey Bunches of Oats. Check out the olive oil maple recipe on BGSK! 2. Oatmeal. As with homemade granola, you add the sweetener on top of the oatmeal, eliminating unnecessary processed sugars. I like my oatmeal with a dash of skim milk and a pinch of brown sugar. Or try it the way Phoebe’s dad enjoys his breakfast: with blueberries and dried cherries. 3. Oat bran. With only a two-minute cooking time, oat bran is perfect before rushing off to class. Add some bananas and honey, and you’re out the door. 4. Grits. The creamy texture of grits is perfect for cold wintery mornings. Keep your morning sugar-free by going savory: embellish with a sprinkle of cheese and a slice of butter. And, if you like your breakfast stick-to-your-ribs filling, a fried egg. 5. Whole grain cereals.If you prefer cold cereal, stick to whole grains that are more filling, healthier, and give you more energy than their over-processed surgar-laden alternatives. One-ingredient whole grain cereals (shredded wheat, puffed wheat, oatmeal) usually do not contain refined grains. 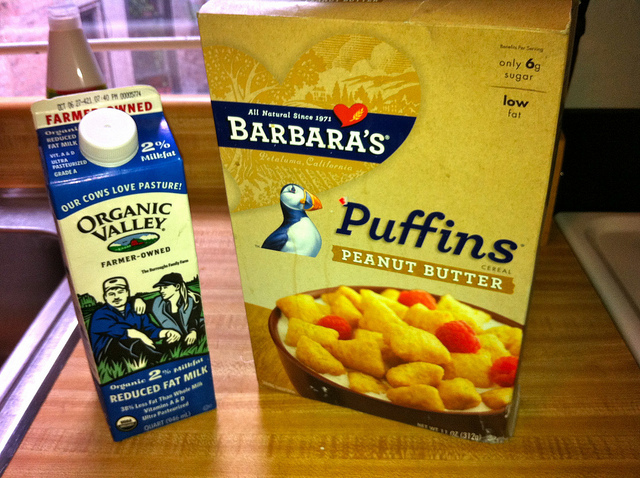 Kashi, Healthy Choice, Grape Nuts, Puffins (pictured) and Cheerios are all great whole grain options. Watch your serving size! 6. Bran. 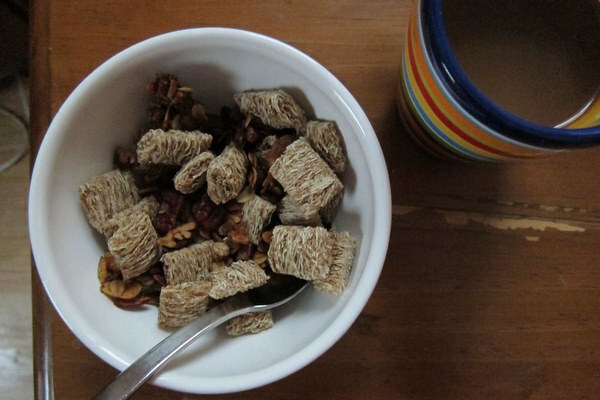 Another great cold cereal option are bran cereals packed with fiber, Vitamin B, and iron. Try Raisin Bran, Multi-Bran Chex, or Cracklin’ Oat Bran. 7. Wheat Berries. Wheat berries great because of their versatility; tasty for breakfast, or as a side salad for lunch or dinner. Try adding some chopped cranberries, walnuts, and maple syrup. Whip up a big batch in the morning and save the rest for dinner.